Netflix's streaming selection has always been pathetic but since we recently cancelled it we've been checking out more of the content we'd previously ignored - like HBO On Demand. Last night we watched "Hereafter" with Matt Damon and I really enjoyed it. It hit the spot on a quiet Sunday evening after the kids had gone to bed. I tend to like Matt Damon movies and I liked the way three stories came together. The melancholy music and cinematography was enjoyable too. If I were describing to you in person whether I liked it and how much I liked it I'd probably say "It was pretty good!" with enthusiastically raised eyebrows and an earnest head nod. I'd recommend it, but I wouldn't want to be held liable if you didn't like it. That being the case, and since it's a movie rather than wine, I'd rate it 3.75 out of 5 stars. But what does that mean? When it comes to ratings systems for wine, I really like the 100-point scale because it's immediately intuitive and because it's the dominant system used for rating wine. But the 5 star scale seems to be dominant in movies. And music. And apps. And for rating businesses on Yelp. Yet I'm more confused on how to use the 5 star scale than the 100-point scale. Why? I think it may have to do with having more experience reading and relating to wine ratings using the 100-point scale. There's nuance built into the 100-point scale that's not immediately apparent. While I can look at a Yelp review for a Pho restaurant in Chinatown and tell that more people liked a 4 star place than a 3.5 star place, how do I decide whether to give a place 3 or 4 stars? I don't know. Using that scale as a reference, a 3.75 star rating for "Hereafter" feels right. I liked it. But did I "really like it"? Probably not. Two weeks from now I may not remember it. If it were a wine I'd probably rate it 88 points. But how could that be? 3.75 divided by 5 equals 75. How can 3.75 mean "88"? For starters the 100 point scale doesn't go below 50. You get 50 points just for turning in a bottle of wine. It's possible to get a 1-star review for a product on Amazon that really disappointed you. Or a restaurant you'd never go back to. But there's more to it than that. One thing that's not immediately obvious when you see a numerical rating for a wine is how it fared compared to other wines. Anyone can tell that a critic likes a 91 point wine more than an 86 point wine. But what about an 82? Okay, so anything rated 80 or better is good. 80 or better somewhat correlates to "recommended" whereas 74 or below is "not recommended". However, only truly horrendous wines seem to be not recommended. 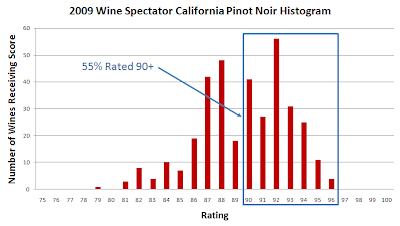 If we look at Spectator's recent ratings for 2009 California Pinot Noir only 1 wine out of 356 was rated less than 80. Only one! All of the wines were good. All of the children were above average. That's not to say their ratings are useless. Far from it. You just have to look a little harder for the meaning in the ratings. Side note: Other publications have the same or even more optimistic curves so the phenomenon isn't specific to Spectator by any means. What I'm looking for when I look at the chart above is to find the wines in the top 20% that are attainable for a reasonable price. Or the wines rated 90 or better than can be had for $30 or less. I like the 100 point scale because it establishes a rank order and a bell curve. On its own a numerical rating doesn't mean much. But if I can find a wine a critic describes as being the best of the best I can find what they think are the best values and make buying decisions based on that. If it works out well I'll rely on the critic again. If not I won't. Movies pretty much all cost the same but with wine and restaurants costs vary. Should the cost of a wine or a restaurant play a part in how it's rated? Wine ratings from the major publications do not include a component for value. They attempt to rate wine according to its quality. Yet I read wine reviews all the time that say something to the effect of "I'd rate this wine 86 points but since it's only 10 bucks I'll give it 90 points". That seems strange because I'm expecting everyone to follow along with the same convention - that price shouldn't play into the rating. Yet I can understand why there would be ambiguity on the matter. Can a BBQ joint get a 5 star rating? Is there such thing as a 100 point White Zinfadel? In wine there seems to be an unwritten rule that prestigious categories like Bordeaux, Napa Cab, Brunello and others should get the highest ratings. Things aren't normalized. The best Sauvignon Blanc never scores as highly as the best white Burgundy. With hotels there is a measure of how excellent and full-service the establishment is baked into its 5-star rating. But when rating pizza places should I compare those side by side with my favorite fine dining establishments? Or should my favorite burrito joint get 5 stars like my favorite steakhouse? Film critic Roger Ebert touches on this subject in this piece. He points out that his former colleague Gene Siskel liked the definitive "thumbs up/thumbs down" approach. Did you like it or not? No sitting on the fence. I have to say, as a casual consumer of their recommendations I never had difficulty interpreting what "two thumbs up" meant. Maybe others are confused by the 5 star system as well. Here comes Stamped - which reduces the equation down to one question: "Does it deserve your friend’s stamp of approval?" Fast and simple. Quick and dirty. Maybe I'm overreacting to be concerned a friend might think less of me if I "Stamp" a movie or give a restaurant "thumbs up" when it's just "pretty good". There's nuance in this stuff. But at the same time maybe you just want to give a quick review and move on. And that's why I've been seeking out a venue to post 140 character reviews of things. Yelp seems to want me to spend so much time writing a review that I feel like if I've spent that much time it's worthy of a blog post. And based on interactions I've had with Foursquare's founder on Twitter, they don't seem to be interested in the market either. So I just tweet my thoughts and move on. If you know of a good site for sharing micro reviews of businesses let me know. Because I'd like to contribute. And I'd like to read the reviews. Because I'd like to know what 100 regular people think as much as what 3 heavy content creators think. Bringing this back to wine, I think it's undeniable there's excessive enthusiasm for wines rated on the 100 point scale. If I had a nickel for every time I read a review describing an "excessively tannic wine" with "a bitter streak at the end" that was "hard to get through" and ended up getting dumped out yet received an 80 point (or better!) rating I'd probably have about $10 by now. Yet I can understand why people give 82 point ratings to bad wines. Because they want their ratings to be normalized to the dominant wine critics in the field who they themselves are probably being excessively friendly to the wineries and importers who supplied them with samples. It's a real dilemma. 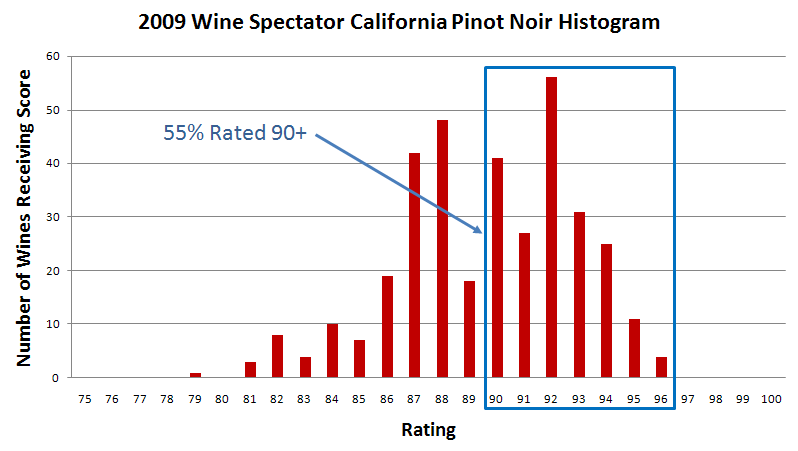 Do we as amateur wine critics normalize our ratings such that the meaning of our numerical ratings align with the pros? Or do we forge our own more conservative approach that aligns with the intent of the guidelines behind the ratings ranges that pretty much everyone agrees on? It's a tough question and I honestly don't know the right answer. If nothing else, next time you write a CellarTracker review for a wine, try checking whether the numerical rating aligns with the tenor of your tasting note. Did you give an 80+ rating to a wine you didn't like? If so, why? I'd be remiss if I didn't point out something really interesting here and that's this: Movie rating scales invite critics (amateur and professional) to share how much they like something. Wine ratings invite everyone to assess a wine's "inherent quality". In short - what a bunch of a bunk that is. If critics are assessing wine according to its quality and they themselves can't find something to like or get excited about it's unlikely the ratings will serve what should be their primary purpose which is to give consumers actionable buy indicators? Not likely. If I'm honest, flavor profile plays way too large a factor in the numerical ratings I assign to wines. People have different tastes so not everyone will agree on what tastes good. But such is life. All we can do is the best we can do describing to others how much we liked something and why. What do you think? How should we be using the 5 star scale to rate things? What's the best way to concisely convey to someone else how much you like something? Does the answer depend on what's being rated? If so why?